Bare metal recovery allows restoring drive or OS images onto non-OS drives, including new disks or completely new computers. Handy Backup can serve as perfect bare metal backup software, allowing restoring drive images taken by the program with the dedicated Disaster Recovery (HBDR) tool. When You Need for Bare Metal Restore? If you are replacing your hard disk or a whole machine to a roughly equivalent unit, you may feel a need to transfer your OS and environment onto this new hardware. If some mishap or trouble strikes your machine, and you are repairing or replacing a hard drive, make the bare metal recovery to reset all your data and settings into the place. Sometimes, this is a need to make some clones of your OS (for example, to multiply a pre-configured Ubuntu Linux onto many laptops). The bare metal recovery can help you there! Do not use bare metal backup software to take unlicensed clones of Windows! Caution! This is against the law! Some hardware can be in conflict with a copy of Windows moved to another machine, when other still can work without problems. Transferring bare metal recovery copy to other hard drive often brings no problems, although you must check that a new drive has enough capacity to store a system! The last statement can be crucial, as a typical Windows 10 bare metal backup (including all programs installed, user libraries and so on) can take from 50 to 200 GB and more, so always check out your storage drive capacity before attempting restoring an image! The advanced solution for expert users and pro-level workstations, the Professional edition contains a free option of using Disaster Recovery for bare metal recovery of Windows 7, 8, 10 and Linux! 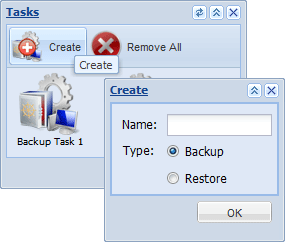 How to Make Bare Metal Restore with the Disaster Recovery Tool? Firstly, check that you have all you need to perform bare metal recovery. The Disaster Recovery utility. You can obtain it freely from Handy Backup (for users of all editions except Standard and Free for Cloud). A USB drive with a copy of HBDR, which you make from the program during installing the Disaster Recovery tool. A copy of your Windows, Linux or data drive, taken by HBDR or by Handy Backup, to restore on bare hard drive. A bare metal hard drive or a computer containing it. Load a target computer from a USB device containing the HBDR and your hard drive image. After booting up, you will see the Disaster Recovery desktop. Now please follow the next sequence of actions. Open the Tasks window by clicking twice on the icon. On the toolbar, click New Task. You will see the New Task dialog window. Here, specify a name for a task in the Name field. Click OK. You will see the task window for this task. Return to the desktop and open the My Computer by double-click. Open the drive corresponding to your USB flash with a disk image. Browse for the file containing a disk image that you want to restore. Drag-and-drop the image file into the What to Restore folder in the task. Now return to My Computer and double-click onto your primary hard drive as a target for bare metal recovery. Drag-and-drop full drive image object into the Where to Restore folder of the task. Now click Restore on the toolbar to run your task. This video tutorial will help you set up a backup of a Windows drive image using the Disk Handy Backup plug-in for disaster recovery! That is all! Regardless of your original OS, Windows 10 bare metal backup and recovery brings no differences with Windows 7 or Linux restoration. The Disaster Recovery utility can restore even such “alien” images as FreeBSD or Mac OS X, as it uses logical drive images instead of file systems. If you want to try Disaster Recovery to perform bare metal restore of your OS or data drive, do not hesitate! Download and install Handy Backup just now – 30 days free trial with all functions!